Guest blogger Pableaux Johnson is a New Orleans-based food writer and photographer. 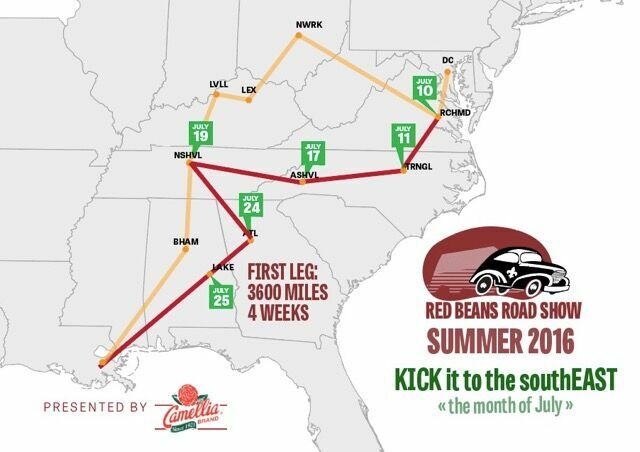 He spent the summer traveling the country with the Red Beans Roadshow, a pop-up dinner series that brings a bit of New Orleans to restaurants across the U.S. Looking around my kitchen on a recent Monday night, I got a strange but familiar feeling. It was time to cook a batch of red beans (my early week go-to), and everything in the kitchen was exactly where I thought it would be. All the pots, cutting boards, knives, and measuring spoons appeared right where I needed them, and the sights, sounds, and smells of the kitchen had something special about them. 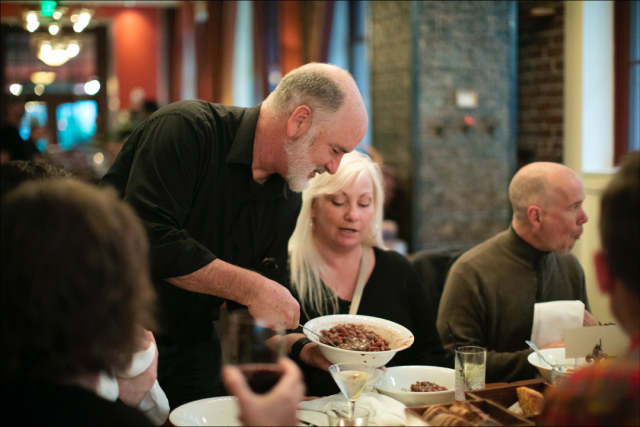 Then it hit me: After a couple of solid months traveling with the Red Beans Roadshow, I was feeling the sensation of cooking in my own kitchen for a change. During most of the summer, I’ve been covering a whole lot of the country cooking red beans, but in LARGE batches in restaurant kitchens. Instead of feeding my usual 10 folks on a Monday, we’d serve anywhere from 40 to a whopping 100-and-change on a North Carolina patio. 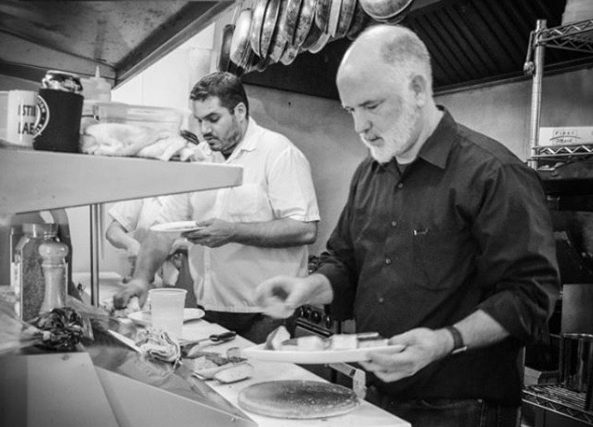 I got to work with some amazing chefs and their hard-working crews and see how many different kitchens tick. I worked behind gas burners that could power a medium-size blast furnace. 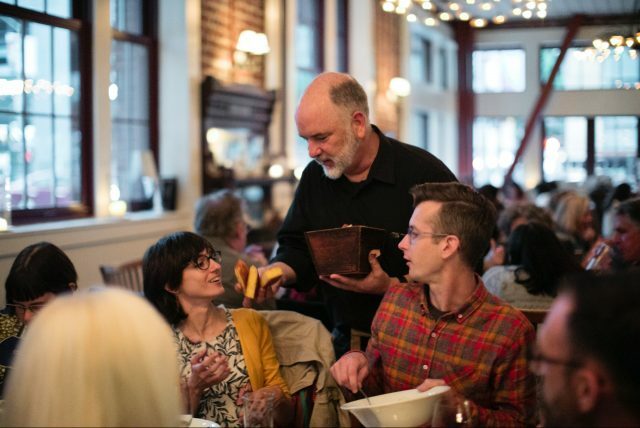 I learned the rhythms of service in San Francisco, Seattle, Chapel Hill, Atlanta, Richmond, Asheville, and New York — and had a great time in the process. 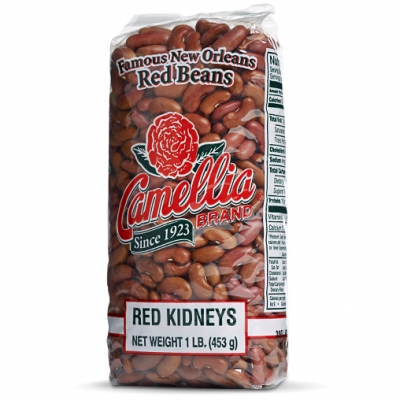 Over the course of two months, we served about 800 folks one of New Orleans’ culinary cornerstones — a simple meal of red beans and rice with hot skillet cornbread — and did the best we could to showcase the everyday wonders of a well-cooked Monday supper. We encouraged folks to pocket their phones, pour a glass of wine, and have a conversation around the table with someone they might not know. We served family-style and encouraged them to get seconds — though they’d have to get up and serve themselves, just like at home. From city to city, I enjoyed watching a progression that happened every night. 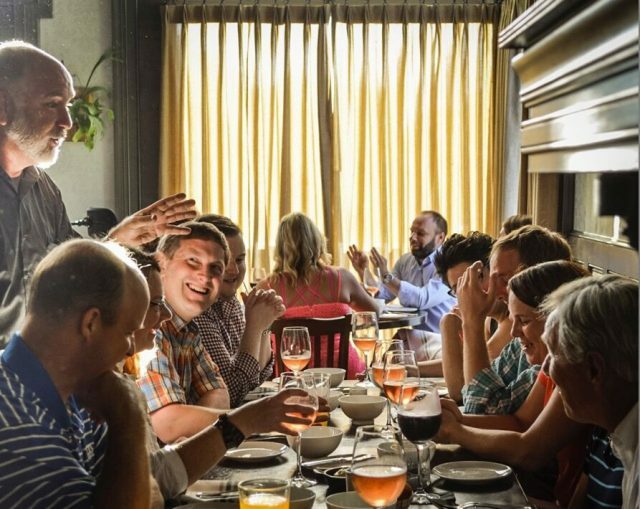 Folks would filter into the bar — quietly at first, then feeling a little more comfortable as they nibbled on deviled eggs or country ham, not really knowing what to expect. They’d mostly sit with strangers, and by the end of the night, the room would be filled with the happy roar. Happened every time. And as a host — even as a traveling one — it’s one of the best things you can ask for. So as I go through the motions in my own kitchen — chop onions and peppers, dice my garlic, salt and sweat it all down — I’m remembering how this simple dish can bring people to the table. Not as a fancy dinner party or a special occasion — but as an elemental, edible Louisiana tradition that brings folks together and works a kind of magic in the process. With the vegetables nice and lazy and the smell of browned sausage coming from the stove, I add the red beans to the pot and tweak my seasonings. And it being MY kitchen, everything is in reach and just where I want it. But tonight, my beans will come to a boil and I’ll crank down the flame to a slight simmer. I’ll straighten my house (just barely) and hit my rice cooker’s clunky ON button. Mix up a batch of cornbread and crack a beer.